A huge thank you to Minted for providing the invitations and decorations to help make our celebrations extra special! I feel like just a few months ago I was sitting here putting together my post for Harper’s 2nd birthday, and now her 3rd birthday party has came and went. That sounds like such a typical mom statement, but it’s true! Last year you may remember that we decided to go with a puppy themed party because Harper is a huge dog lover. 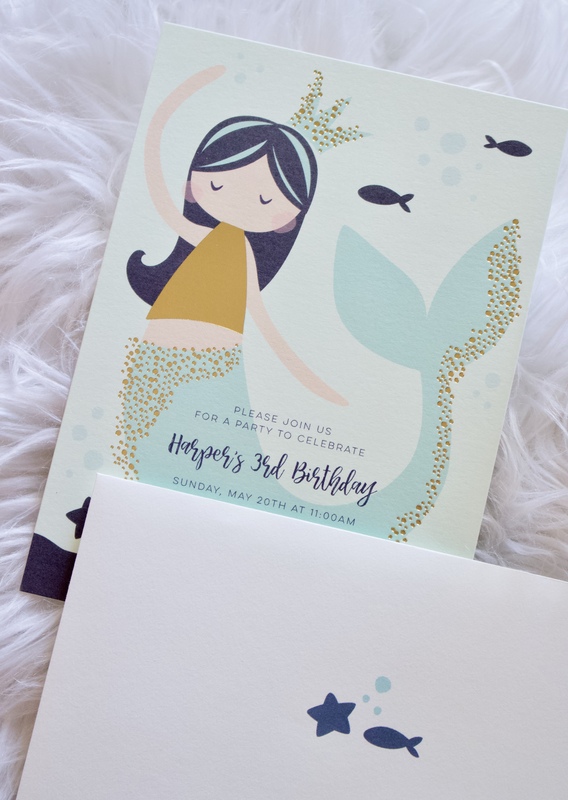 Her love for animals has definitely grown in the last year, but so has her love for mermaids. Honestly I have a Barbie movie on Netflix to thank for that! 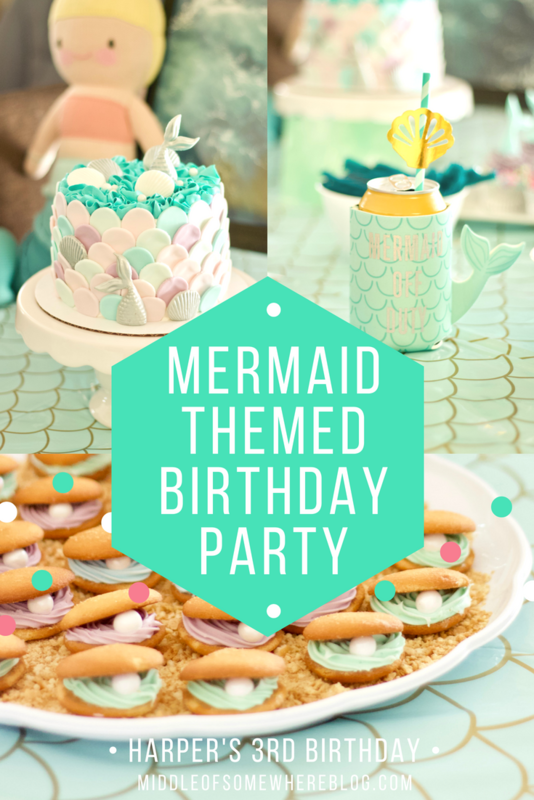 Either way, I fell in love with the idea of a mermaid themed party for her 3rd birthday and decided to run with it. 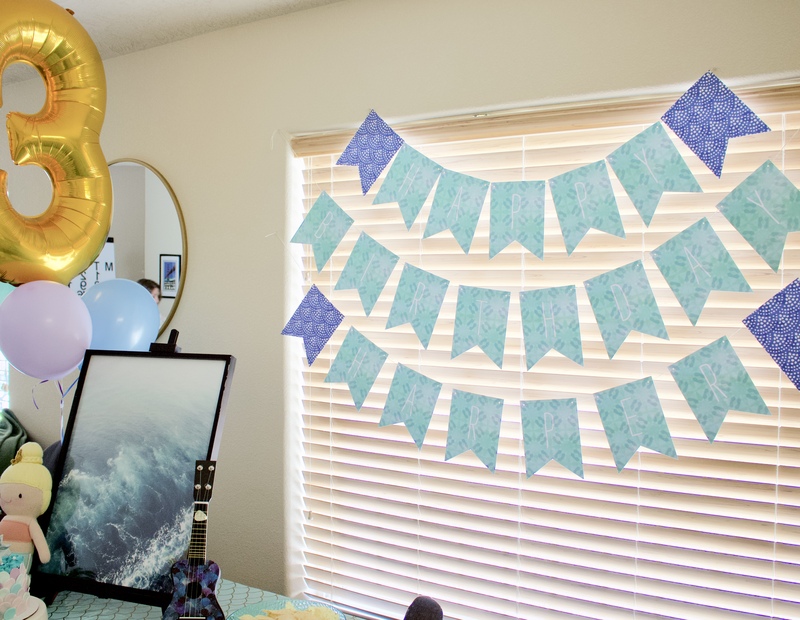 When it comes to birthday parties for Harper, I try not to go overboard with the decorations. We are yet to have a large party with a lot of guests, and this year was no different. 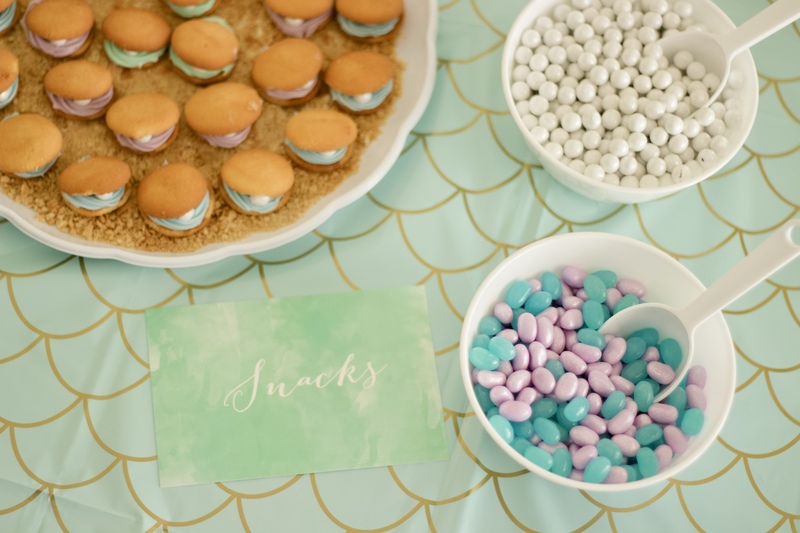 We kept the mermaid party guest list to a minimum, which helped make the occasion a lot less chaotic and a lot more enjoyable. I know as she gets older, it will be harder to keep the parties small so I am trying to enjoy it now while it lasts. 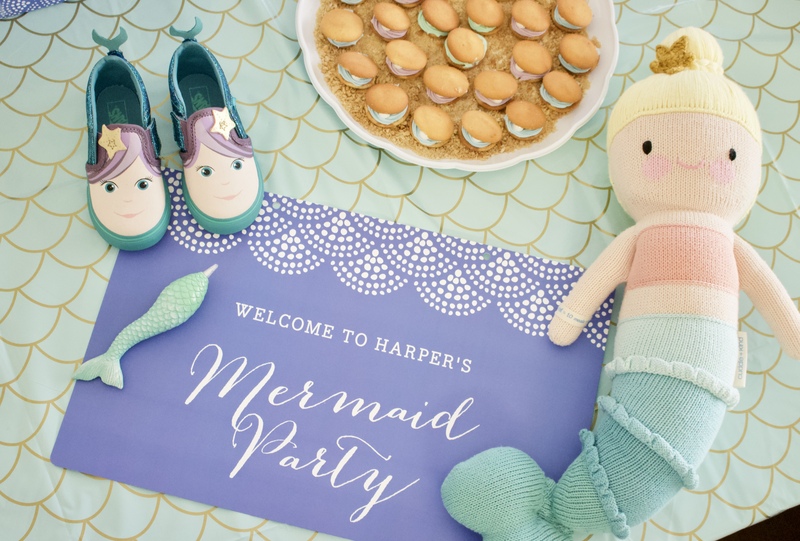 Minted has been my go-to for birthday decor for every single one of Harper’s parties. 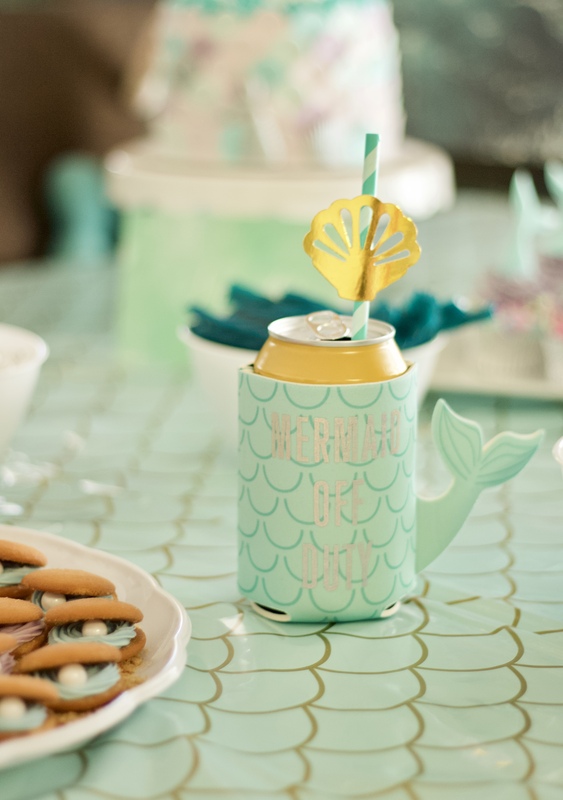 After the mermaid theme was set, I searched through their party decor to find a pattern that fit. 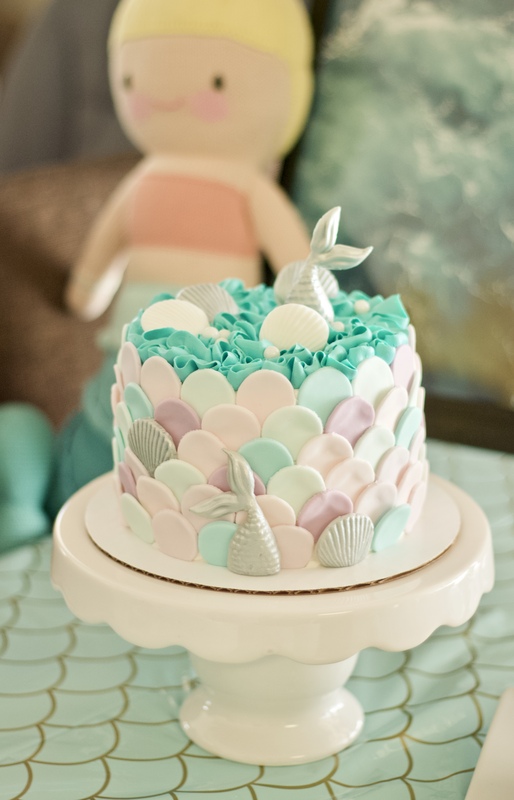 I immediately fell in love with the Beach Bohemian set, and wound up basing the rest of the decor and the cake on that color scheme. Since I am not a big fan of pink or purple, I was thrilled to find decor in shades of blue and green instead. Finding additional decorations, including the table cloth, was surprisingly easy, thanks to Target (of course)! 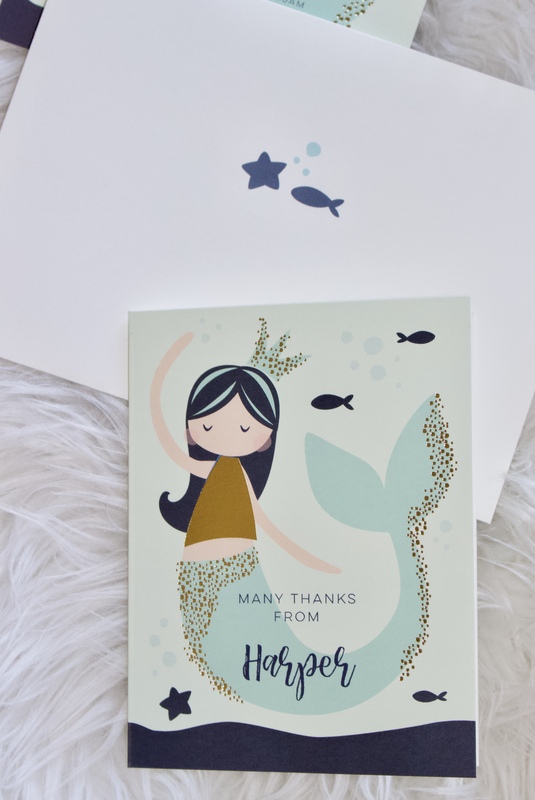 I can’t even handle of the cuteness of the invitations and coordinating thank you notes! The gold foil detail is so pretty without being over the top. We also sprung for the matching custom stamps because you only turn 3 once! The invitations matched the decor perfectly, and I was so happy with how everything came together. When deciding on the food that we wanted to serve, we opted for a simple, yet delicious taco bar. My husband grilled two different types of meat and we offered both flour and corn tortillas. We served it with a buffet of all of the traditional taco toppings. We even made my favorite green chile queso because what taco bar is complete without queso? There were some vegetarian options, including sautéed peppers and onions, as well as plenty of guacamole and salsa! The best part of the menu was planning out the desserts. I wish I could take credit for the adorable clam shell cookies that we served, but I definitely cannot. 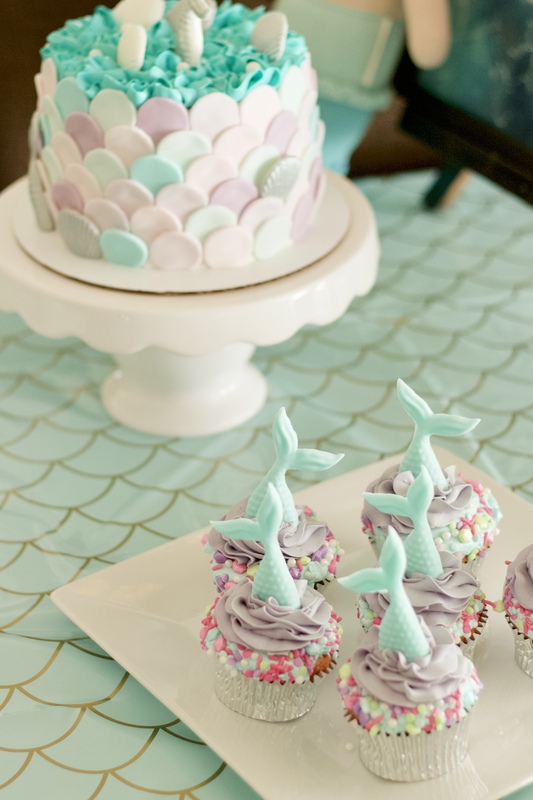 In preparing for the party, like any typical mom would, I scoured Pinterest to get inspiration. 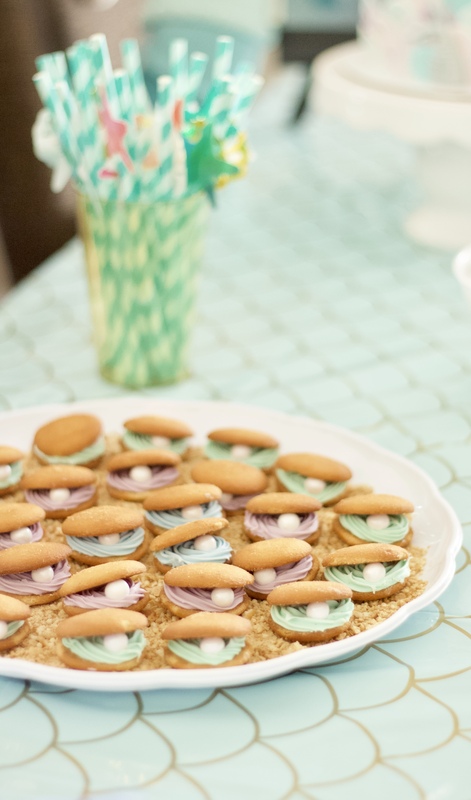 These clam shell cookies popped up a few times, and they were too cute to not make for the party. 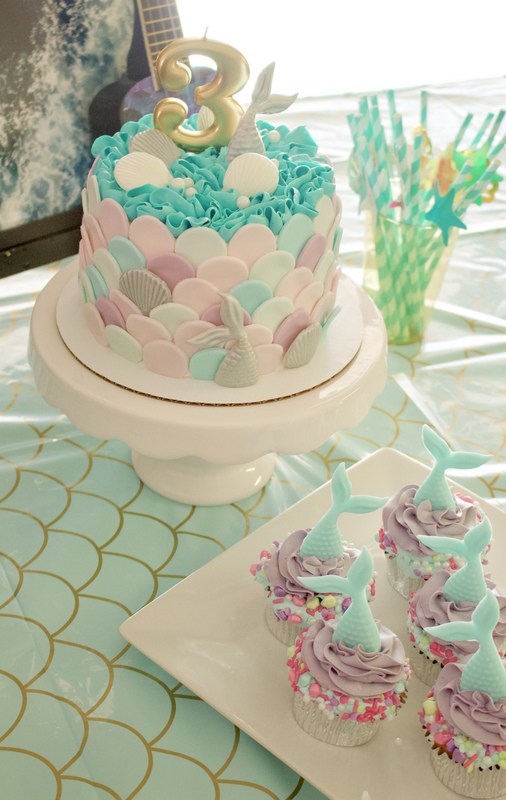 I also cannot take credit for the gorgeous birthday cake and coordinating cupcakes. We had them made by Albuquerque Cupcake Creations, who also made the puppy cake at Harper’s 2nd birthday party. The desserts definitely made the party! 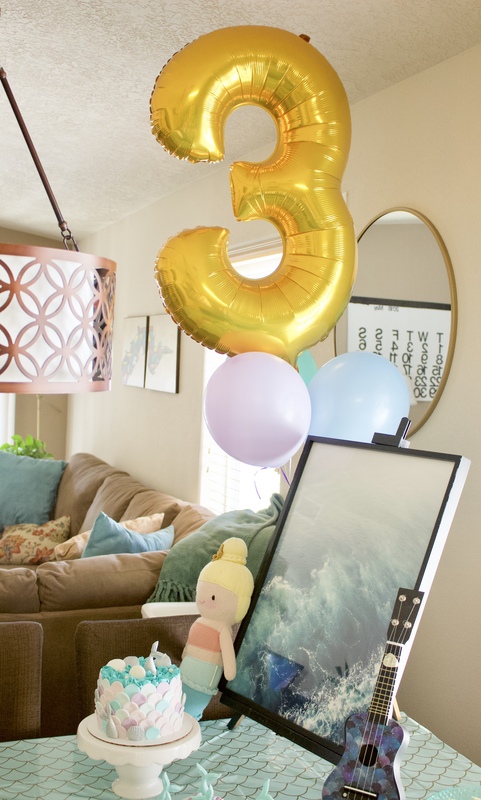 We had such a wonderful time celebrating Harper’s 3rd birthday, and I’m so happy with how everything turned out! 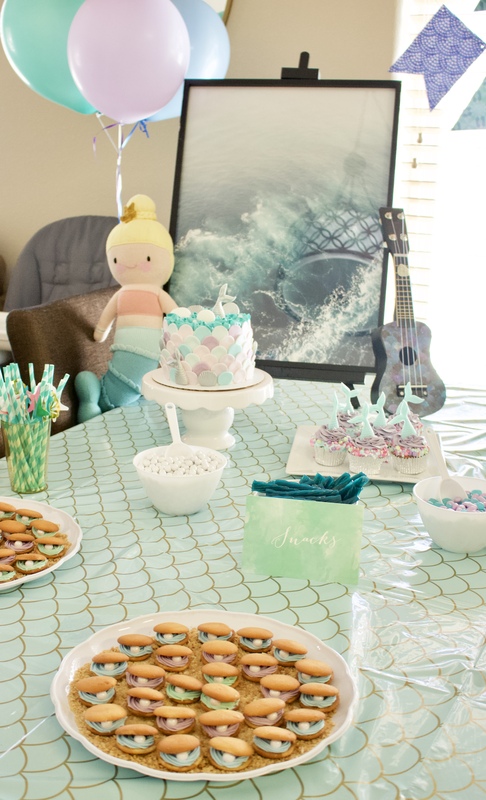 A mermaid themed party was the perfect way to honor the birthday girl. I am so grateful for our wonderful family and friends who helped us celebrate!